Biogel Latex Powder-Free Surgical Gloves, by Molnlycke, are sterile, individually packaged pairs of latex gloves designed with healthcare professionals in mind. These are highly tactile gloves that have safeguards to minimize the effects of potential allergies. The design is to enhance the fit and feel of surgical gloves as well as utilizing Biogel -- the substance by Molnlycke that allows donning the gloves, wet or dry, easier to do. 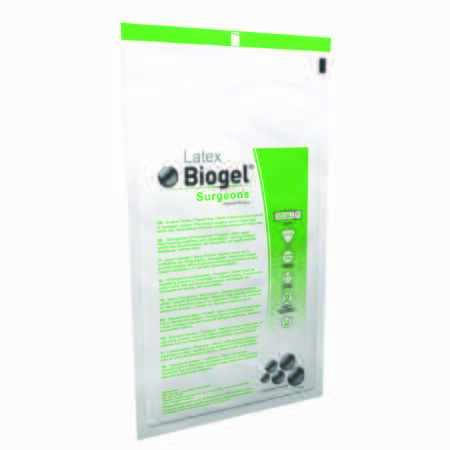 The Biogel Latex exam glove shares the features that make rubber latex the most comfortable of wide selection of exam gloves. However, unlike many common exam gloves, Biogel gloves are shaped for each hand. They are powder-free and have low-protein. This minimizes the risk of allergic reactions to aerosolized natural rubber latex proteins, and also the risk of starch powder-related complications. The gloves have a micro-roughened surface for gripping ability. They have a beaded cuff at the wrist. The Biogel gloves are also made to resist tears and holes. According to Molnlycke, non-Biogel gloves are at least 3.5 times as likely to fail than Biogel gloves. The gloves are shaped for each hand. They have micro-texture for better grip. The gloves include Biogel to assist donning them wet or dry. The beaded cuff at the wrist adds to security and will simply slip over the cuff of the arm gown. The Biogel and glove material prevent skin irritation and soothes skin by preventing moisture loss. They are powder-free and the latex is of a low-protein rubber to minimize risk of allergic reactions to aerosolized latex proteins.